The combination meter has an integrated buzzer that is activated when it receives a signal from the BCM via CAN communication. 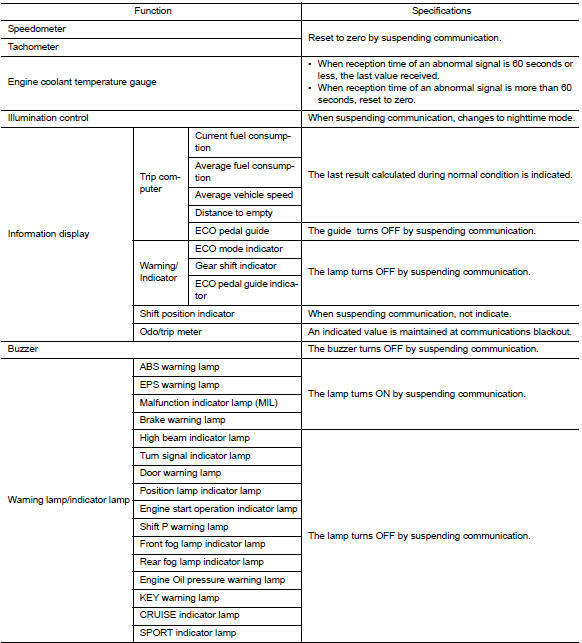 Refer to WCS-6, "WARNING CHIME SYSTEM : System Description" for further details. The combination meter includes an on-board diagnosis function. The combination meter can be diagnosed with CONSULT. 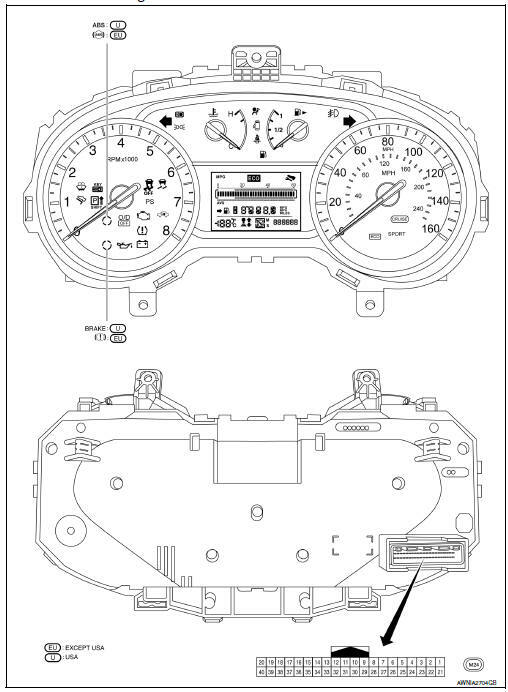 The ABS actuator and electric unit (control unit) receives each wheel speed sensor signal and provides a vehicle speed signal to the combination meter via CAN communication. The crank position sensor sends a crankshaft position signal to the ECM. The ECM provides an engine speed signal to the combination meter via CAN communication lines. The tachometer indicates engine speed in revolutions per minute (rpm). 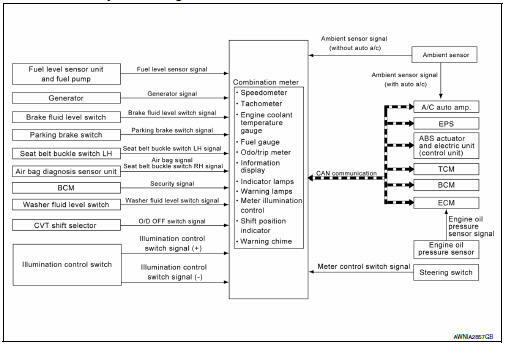 The engine coolant temperature sensor sends an engine coolant temperature signal to the ECM. The ECM provides an engine coolant temperature signal to the combination meter via CAN communication lines. The engine coolant temperature gauge indicates the engine coolant temperature. The combination meter reads the fuel level sensor signal from the fuel level sensor unit and indicates the fuel level to the fuel gauge. The combination meter turns the oil pressure warning lamp ON when receiving a signal from the ECM via CAN communication. Meter illumination control adjusts the brightness of the combination meter illumination using the illumination control switch. The operation of the illumination control switch changes brightness of the meter illumination. The combination meter receives signals necessary for controlling the operation of the information display from each unit, sensor and switch. The combination meter incorporates a trip computer that displays the warning/information according to the information received from each unit, sensor and switch. The combination meter shows the following functions on the information display. Warning/Indication messages (check tire pressure and loose fuel cap). The combination meter calculates mileage, based on the following signals and displays the mileage on the information display. Displays the position of the shift selector based on signals received from TCM via CAN communication. The A/C auto amp. via CAN communication (with auto A/C). The ambient sensor (without auto A/C). The LOOSE FUEL CAP message will display in the information display when the fuel-filler cap is not tightened correctly. The message will turn off as soon as the ECM detects the fuel-filler cap is properly tightened. The ECM provides a loose fuel cap signal to the combination meter via CAN communication. This warning appears when the BCM detects low inflation pressure or a system malfunction. The BCM sends a signal to the combination meter via CAN communication to illuminate the low tire pressure warning lamp. In addition, a warning message will be displayed in the vehicle information display. according to information recieved from the ECM via CAN communication. When the Eco pedal guide bar is in the green range, it indicates that the vehicle is driven within range of economy drive. If the Eco pedal guide bar is out of green range, it indicates that the accelerator pedal is depressed over the range of economy drive. With the ignition switch in the ON position, and the mode switch ON, the compass display will indicate the direction the vehicle is heading. 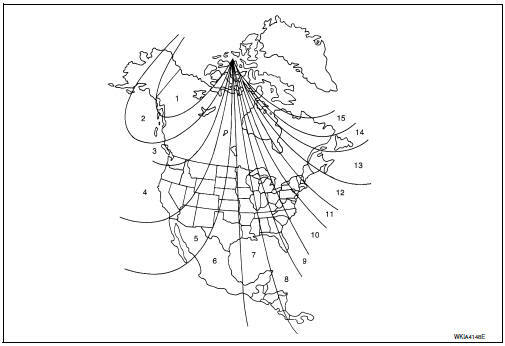 The difference between magnetic north and geographical north can sometimes be great enough to cause false compass readings. This difference is known as variance. In order for the compass to operate properly (accurately) in a particular zone, the zone variation must be calibrated using the following procedure. Determine your location on the zone map. Press and hold the mode switch untill the current zone number appears in the display. Press the mode switch repeatedly until the desired zone number appears in the display. Once the desired zone number is displayed, stop pressing the mode switch and the display will show a compass direction after a few seconds. Use zone number 5 for Hawaii. The compass display is equipped with an automatic correction function. If the compass display reads вЂњCвЂќ or the direction is not shown correctly, perform the correction procedure below. Press and hold the mode switch untill the display reads вЂњCвЂќ. Drive the vehicle slowly in a circle, in an open, safe place. The initial calibration is completed in about 3 turns. In places where the terrestrial magnetism is extremely disturbed, the initial correction may start automatically.